Smaller car = less weight = less energy to get from A to B. It's a simple equation that's well understood by those looking to design the car of tomorrow. Among them is Alan Kravchenko, an industrial designer who caught our eye with this clean-lined concept for a compact urban commuter dubbed the Peugeot Clear. Drawing inspiration from the Peugeot marque, the Clear has enough room for two at a squeeze and is laid bare by large windows that, without heavy tinting, leave just about everything going on inside open to plain view. 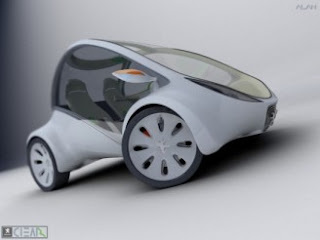 As well as being compact, Kravchenko’s designaspires to green credentials by way of an electric drivetrain. Though technical details are scant, the design incorporates hydrogen and oxygen fuel tanks (presumably to feed a fuel cell) positioned so as to provide most efficiency to the wheel-mounted motors. The designer also uses tunnel cooling radiators to prevent overheating.